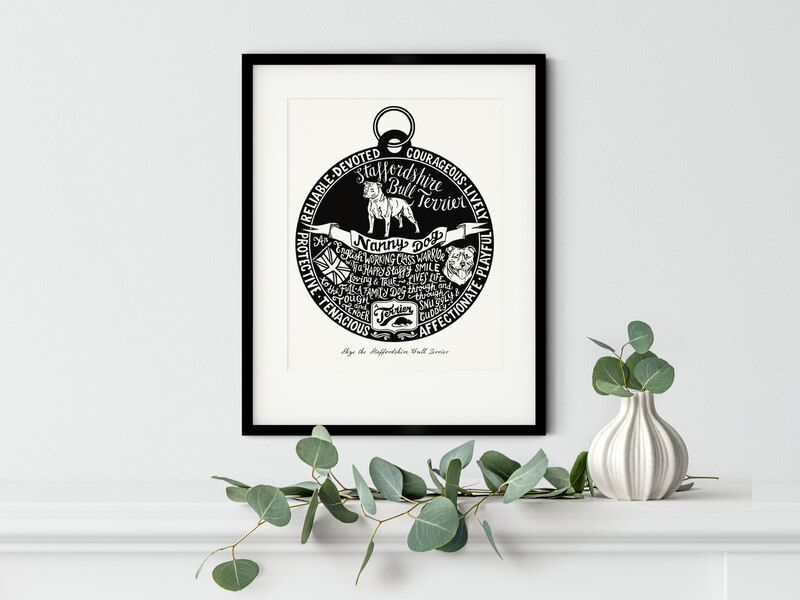 This print combines hand-drawn letters with illustration. 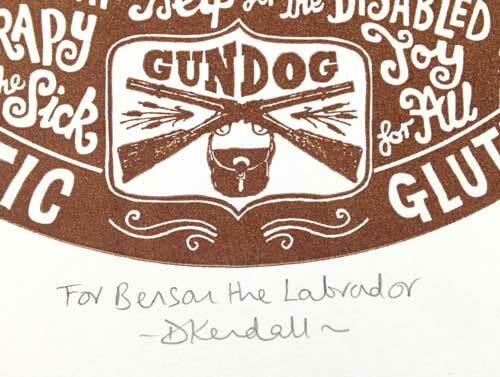 Each one is individually hand-printed on my press in a deep inky green, and signed. We LOVE your design! Describes our Harley perfectly. Best description of a Staffy Bull we've ever seen. Thank You! 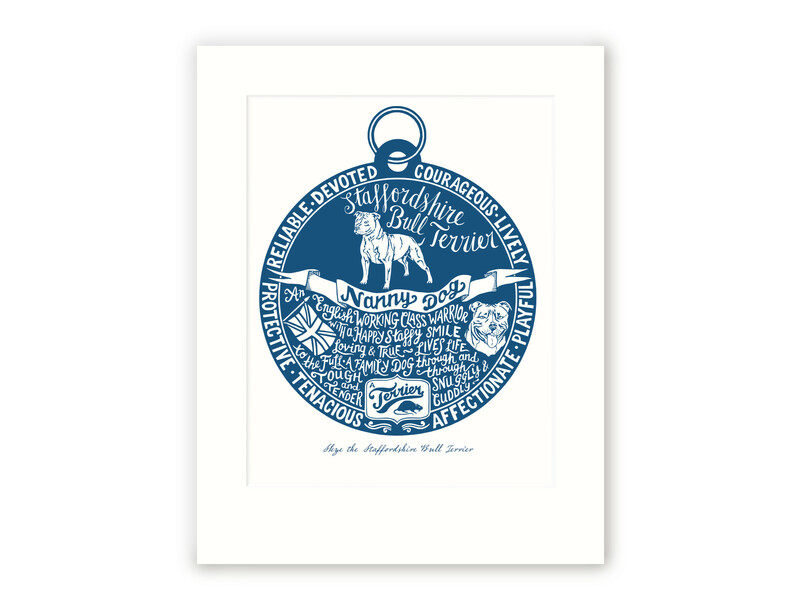 Just wanted to say thank you so much for the staffy dog tag print. It was for a friends birthday yesterday and she just loved it! It arrived so quickly and it was packed so well, it arrived in perfect condition. The popular Staffie is much misunderstood and often unfairly maligned by the media. They are (according to Kennel Club statistics at the time of writing) Britain’s 5th most popular dog, yet they also top the list of breeds in rescue centres and shelters in the UK. 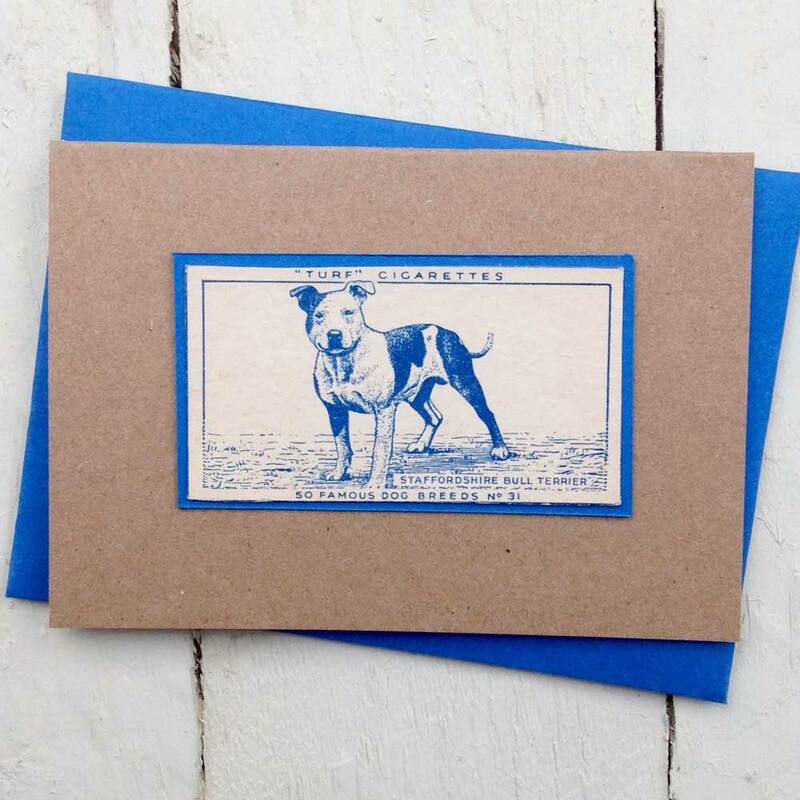 The truth is that while the Staffie might look like a tough dog, they are actually big softies - a loving, reliable and affectionate family dog, devoted to their human companions. 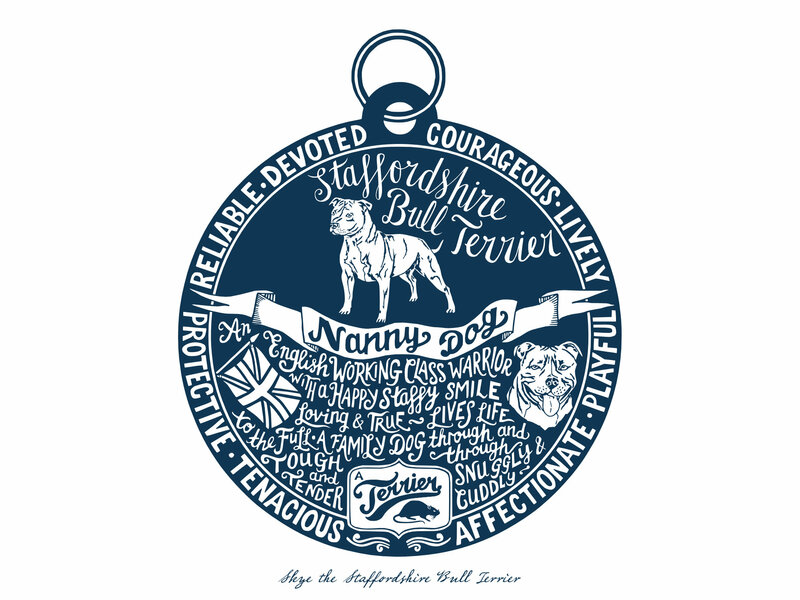 The Kennel Club recommends the Staffordshire Bull Terrier as being particularly suitable for families with children - one of only 2 breeds to deserve such a high accolade - and they describe the Staffy as “extremely reliable, highly intelligent and affectionate, especially with children." 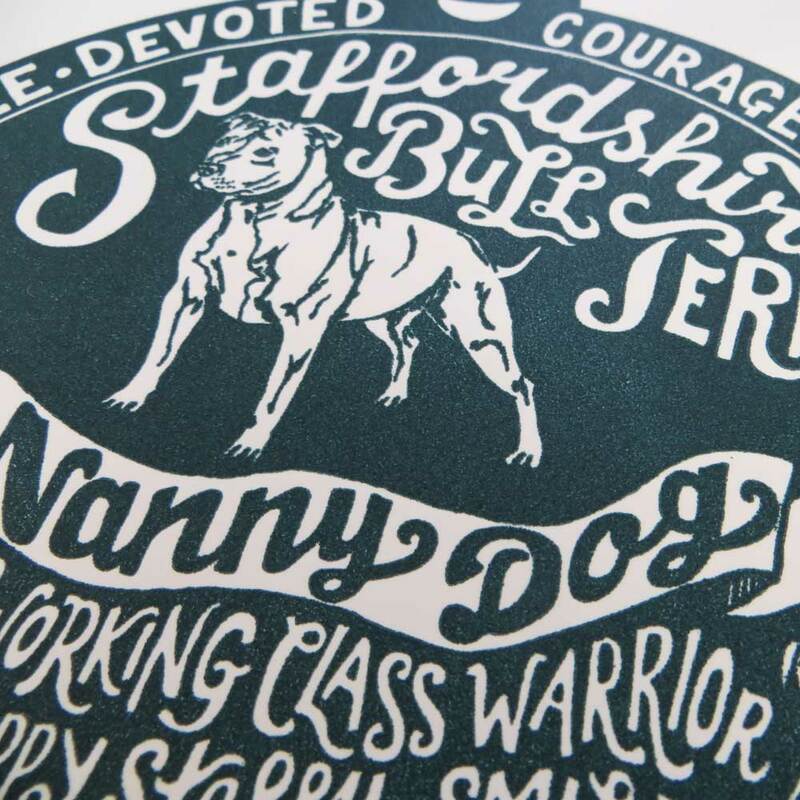 Created in England in the late 18th and early 19th century, Staffies were a cross between Bulldogs and Terriers, bred for the ‘sport’ of dogfighting by working class men. Staffies were expected to live harmoniously with their families, often in small spaces with lots of children. No aggression towards humans was tolerated and it is said that any dogs showing even the slightest signs of ill will towards their family members were ruthlessly weeded out.